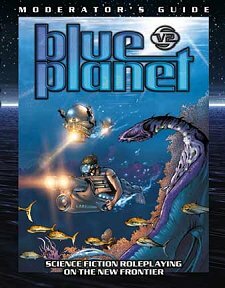 This book contains a vast amount of background information about Poseidon, the setting for Blue Planet. It's packed with detailed information and scenario seeds to inspire any Blue Planet GM to a whole host of adventures and whole campaigns. Publisher's blurb: "Whether you are new to the Blue Planet universe or a veteran moderator, this book contains information vital to running exciting and effective adventures on the new frontier. Regional maps and descriptions detailing the topography and history of the most heavily colonized region on Poseidon - the Pacifica Archipelago. Key maps and detailed descriptions of more than twenty colonial, Incorporate, and native settlements. Classified information on Incorporate, GEO, and native activities on Poseidon. Dossiers on more than a dozen of the planet's most famous and infamous personalities. Biological survey data on the planet's wondrous but often-deadly indigenous lifeforms. Revealing biological and cultural information on Poseidon's aborigines." Authors: Jeffery Barber, Greg Benage, Brian Breedlove, Sam Johnson, and Jason Werner.